Come and see the Shadi Holiday Display. Moeser Lane and Seaview Drive, El Cerrito. Turn onto Moeser Lane from San Pablo Ave and travel east approximately one mile (through one stop light after you are on Moeser). 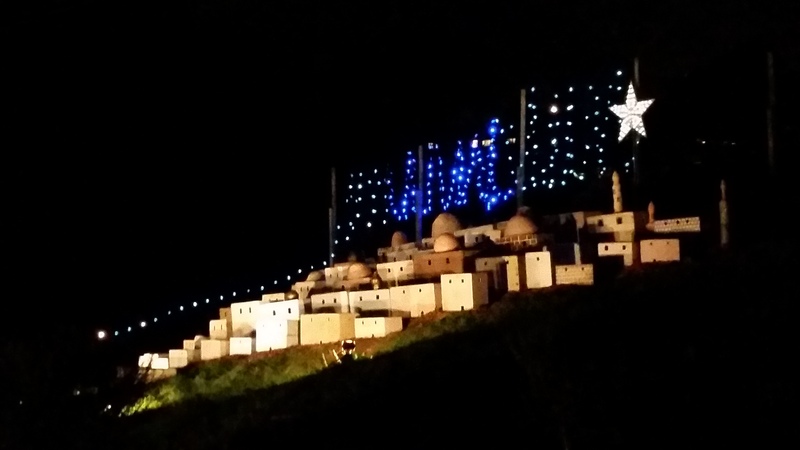 The display is lit from Saturday, December 13, 2014 from 5 pm to 10 pm through Friday, December 26. In June 1900, Sundar Lamba was born in Chak Shadi, a small village in Punjab, India. Both of his parents were born in Punjab, an extensive area in the northwest of India. Major rivers, the Indus, Ganges and the Iruande drained through vast regions, producing fertile soils for agriculture. Grains, sugar cane, Indian rubber and tobacco were some of the main products. Sundar lived on a farm with his parents, five brothers and one sister. During a violent uprising, the family fled to Pakistan. One brother was killed. Another brother died in 1918, during World War 1. As a boy, Sundar was sent to Moslem-Sikh schools. Because of the tropical-like climate and widespread agricultural possibilities, Sundar’s brother urged him to pursue a career in Pomology, the science of agriculture, growth and production. His intent was that Sundar would return to Punjab and spread his knowledge throughout the region. Sundar came to the University of California in Berkeley in 1921. In 1926 he received his Bachelor of Science degree in Pomology and in 1929 he received his Master of Science in Subtropical Horticulture. His return to Punjab did not go as he had expected and he soon came back to the United States. Sundar met Dorothy Cotelle Clarke at UCB, where she was pursuing a career in Spanish. They married in 1934. Dorothy continued her studies and became a professor of Spanish at Berkeley. Sundar and Dorothy had three daughters: Zilpha Tedforda Shadi (Mrs George Roland Paganelli), Ramona Rhea Shadi (Mrs William Walter Miller) and Verna Carol Shadi. They built and lived in their home on the Arlington in El Cerrito. The girls attended local schools and graduated from the University of California at Berkeley. 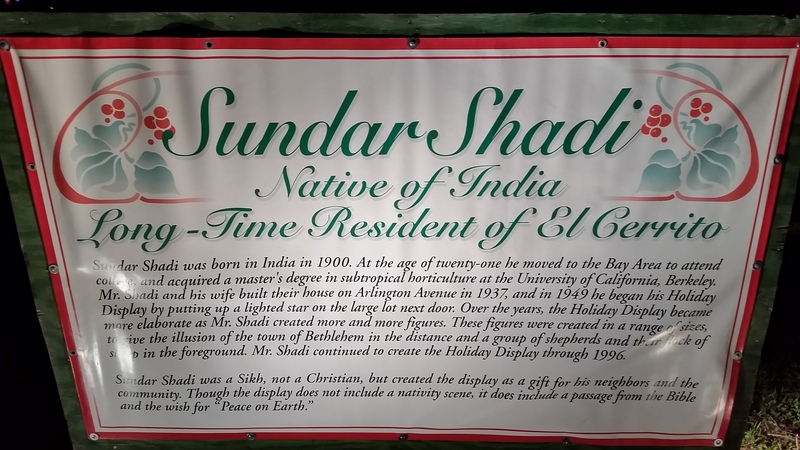 Sundar Shadi became a citizen in 1948. Although he didn’t pursue his profession as a pomotologist, he did continue his interest in the science. He published research about subtropical horticulture and became an elected member of professional honor sciences: Phi Sigma Biological Society and the Society of Subtropical Horticulturists. When he retired, he was able to spend more time with the thousands of flowers he loved at the family home at on the Arlington, in El Cerrito, and start what would turn into a virtuoso seasonal sculpture garden. “It began with a single star in 1950, his daughter said, then it grew year by year. He loved doing it, and it gave him something to do in the fall when his flowers were not in bloom.” And while Shadi knew plants, he didn’t know how to make models of creatures and buildings, especially those that could withstand the rain and chill of an El Cerrito winter. He found that a wooden frame covered in chicken wire formed a good foundation. For the outer layer, he tried various materials, including plaster of Paris and papier-mâché. 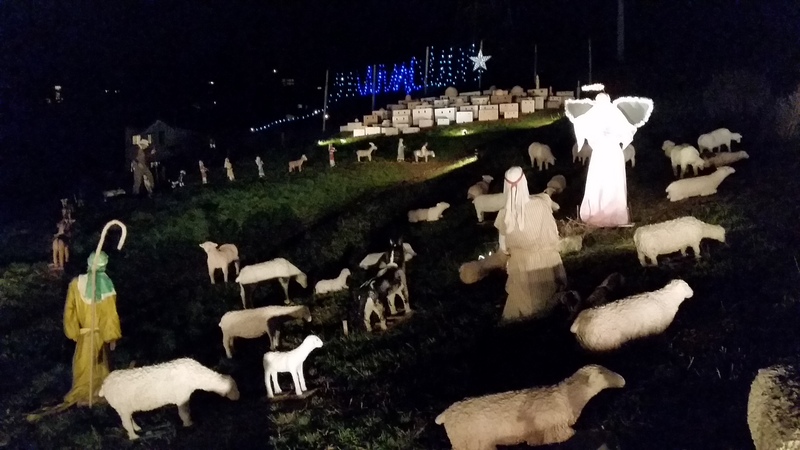 He even tried concrete for some sheep, Rich Bartke said, and eventually seemed to favor stucco. 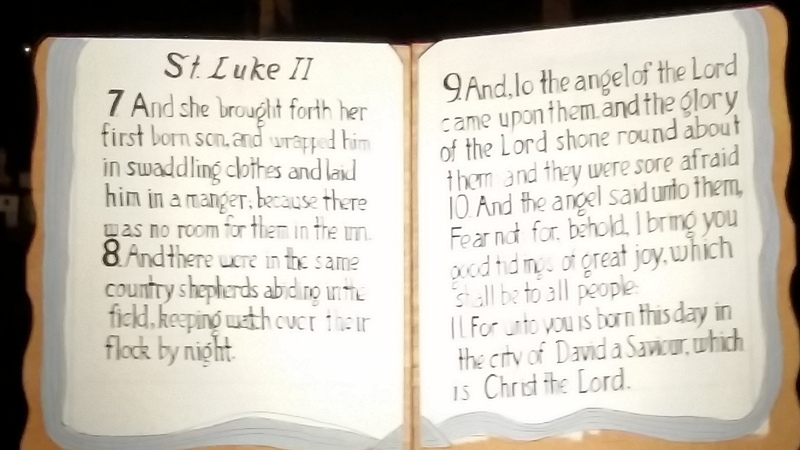 One missing element that surprises many people when they are told about it is that there is no manger, no nativity scene with baby Jesus. Many people will swear to having seen one in the display, but there’s never been one. 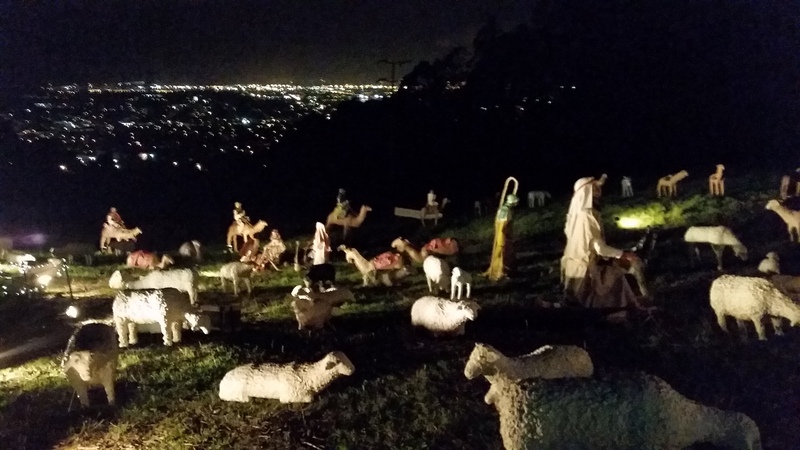 The absence of the nativity scene was a kind of ecumenical compromise. thank you for sharing this lovely story and photo. We need more people like him to make us realize what is important and how much we have in common.